Tamron's 90mm macro lens, often referred to as "the portrait macro" and loved by photographers all over the world, is now reborn as a Di lens that is perfect for use with both film and digital cameras. 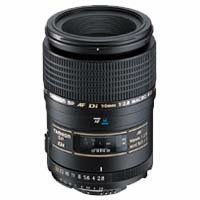 The lens provides outstanding image quality when used with film or digital cameras. Unlike conventional lenses, designed to cope with internal diffused reflections of a mirror box and film surface, Di lenses offer new anti-reflection countermeasures that are essential in lenses designed for use with digital cameras. the 90mm Di features an improved coating technology that reduces the reflections that are likely to become a problem to the absolute minimum. This new 90mm Macro lens also features an improved external design and improved focusing ring. The lens is also equipped with a one touch switchover mechanism to quickly perform one touch switchover from AF to MF by simply sliding the focus ring back and forth (for Nikon AF-D and Canon AF mounts only).